Harry Potter Retrospective Part IV - "The Goblet of Fire"
"Fire" brought my "Potter" experience back to the beginning: it opened just before Thanksgiving, 2005 and I was back home to see it with my family over the break. I was right on the cusp of becoming a full-on Potterite and needed just the final push to send me head first over the edge. "Fire" did that and then some. By the time "Fire" rolled around, I think David Heyman and screenwriter Steve Kloves had found their groove, no matter who was in the director's chair. They knew what literary content needed to be preserved and what had to be chopped, even if it meant reworking characters and settings to get the point across in less than three hours. Things like the combination of Ludo Bagman and Barty Crouch into one on screen character may not have been popular but it was a necessary choice. Likewise, the continued exclusion of all things related to house elves required some creative plot changes but I personally didn't feel the film lost much in its translation. 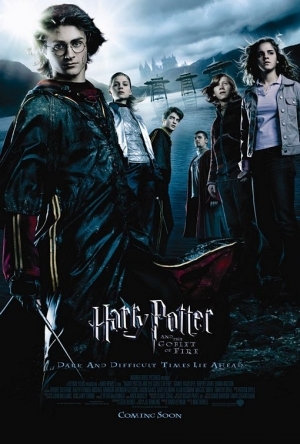 Mike Newell, the third director in three films, did an excellent job of picking up where Cuaron left off in "Azkaban", keeping the dark themes and setting the stage for what was to come. Kloves also added in a fair amount of humor and a number of one liners and I think this is a great addition to the "Potter" universe. Rowling is an exceptional writer with a tremendous understanding of her characters; but her books are almost devoid of humor. "Fire" (the film version) delivers some genuinely funny moments and I think it is better for that. "Fire" struggles in two areas. First of all, the book is slightly (and I do mean slightly) tedious. With the exception of "Chamber", I think this is probably my least favorite of Rowling's works. "Fire" is 300 pages longer than "Azkaban" and it is the only book in the series that I feel has unneeded filler. I think this put Heyman, Kloves, and Newell in a difficult position in that they have to stay as true to the book as possible but there's not quite as much to work with despite the added length. Second, Emma Watson regressed TREMENDOUSLY between "Azkaban" and "Fire. I wrote in my last entry that Watson made huge strides in the third film and was no longer the weak link. Well, she re-assumed that role in the fourth film. She overacts throughout the entire movie and the result is a Hermione that comes off as downright shrill. I have no idea what to make of this because Watson got better from one to two and from two to three, then continued to improve in movies five through seven but "Fire" is a major downgrade. It's a shame, too, because Kloves wrote a script that would have given her more time in the spotlight but she honestly couldn't handle it. Despite those issues, "Fire" excels in several places. The special effects are tremendous. Being the total nerd that I am, I know a thing about dragons and the Hungarian Horntail that Harry is forced to battle against in the tournament is one of the very best movie dragons I've ever seen. "Fire" displayed just how much the franchise benefited from the time Cuaron spent on set in the previous film. In addition, Heyman somehow, once again, added to his already incredible cast by bringing on Brendan Gleeson and the ever impressive Ralph Fiennes. Seriously, best cast ever. Gleeson perfectly personifies the Mad Eye Moody copycat and that's a vital part of the story's tone. And Fiennes provides an incredible payoff for the three and a half film/book build up to the reveal of the fully reborn Voldemort. In any sci-fi, fantasy, comic book, or otherwise epic film or series, the villain is unquestionably the MOST IMPORTANT CHARACTER. It is SHOCKING how many directors, writers, and producers forget this. A hero will only go as far as his nemesis will push him and if you really want to excel, you have to create a villain that will carry the hero to the very brink of his ability and then some. 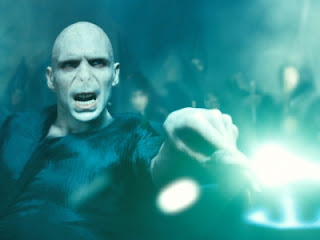 Rowling understood that and made Voldemort that type of villain and Fiennes took up that mantle and carried through brilliantly. The final act of "Fire" is both the best and the most excruciating of the series to this point. Everything, and I mean everything, in word and on screen, builds to this moment when Voldemort is restored and the wizarding world is thrown back into flux. When Harry and Cedric are transported to the graveyard where Voldemort waits, you knew from the second their feet touched the ground that something horrible was about to happen. (Remember, I hadn't read the books at this point.) That entire scene, the killing of Cedric, the ritual rebirth of Voldemort, the battle between good and evil, and finally, Harry's return to Hogwarts with Cedric's body is exquisite and it perfectly, PERFECTLY, matches the tone of the book. When Harry and Cedric hit the ground and the crowd realizes what has happened, it's a true gut punch and takes the series into new territory. This death and the casualness with which it is carried out marks the end of innocence and the loss of youth in this world. To top it all off, the wails of despair that Amos Diggory (Jeff Rawle) lets out as he sees his fallen son...truly sobering. It's a scene that I both look forward to and dread every time I watch "Fire" because it is remarkable acting but it also breaks my heart and brings a tear to my eye every single time. When I walked out of "Fire", I was dying to know what would happen next. I picked up the first book the next day and within a week, a genuine love for the "Potter" world had begun.